If you have suffered serious injury, your primary concern is regaining your health. While you struggle with medical complications, or a complex government and insurance bureaucracy, you may put off pursuing a claim for compensation. Please, don't make that mistake! 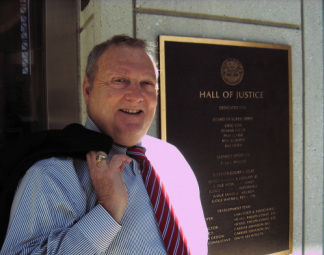 I founded the Law Offices of Norman M. Finkelstein, APC in 1983 to assist clients just like you, who need a reliable attorney to take on the burden of pursuing justice while you concentrate on getting well. I can assist you in cases involving: Personal injury Nursing home negligence Medical malpractice Compassionate and professional My practice has been devoted to vulnerable parties whose trust was betrayed and who were severely hurt as a result. Whether it's a senior victimized by a nursing home, or a patient who consented to a doctor's treatment only to be harmed, my cases affect me deeply, and motivate me to seek restitution. However, I have always adhered to a strict code of ethics, seeking cordial relations even with opponents, a practice which has won me the approval of my peers as one of a small group of attorneys who are AV Preeminent Peer Review RatedSM by Martindale-Hubbell, the highest industry standard for demonstrating outstanding legal ability and ethics. Resourceful and determined You may believe that the more serious your injury, the more likely you'll be compensated. That is not necessarily the case. You not only have to prove you've been harmed you have to prove another party is at fault. And that other party will be zealously defended by the insurance company which would have to pay out. This is why it's so important to retain an attorney with the experience to hit the ground running, who will move quickly to preserve evidence, including witness testimony while memories are fresh. I have accumulated a record of success over 28 years of advocating for injured clients and getting results. In that time, I've developed the resources to take on the large litigation firms hired by the insurance companies. Let me fight and win for you. Contact a compassionate attorney serving southern California My office is conveniently located in San Diego, and I serve clients throughout Southern California, including Los Angeles, San Diego, Orange and Riverside counties. Call my office at 619-232-1815 or contact the Law Offices of Norman M. Finkelstein, APC online to schedule a free consultation. You don't pay a dime until I win compensation for you. Personal injury is a serious matter that can drastically affect your health, your job, your family and your future. If you have suffered an injury because of someone else's negligence, you need an experienced personal injury lawyer by your side. While you concentrate on getting well, the Law Offices of Norman M. Finkelstein, APC diligently pursues the compensation you need to get your life back on track. Subject matter experts to help with your case Throughout my 28 years of practice, I have witnessed the heartache that results from serious injuries and wrongful deaths. With compassion and resolve, I have achieved justice for families devastated by motor vehicle accidents, defective products, dangerous prescription drugs, unsafe work conditions and professional medical negligence. I take great satisfaction in helping injured victims obtain full compensation for their past and future medical bills, lost income, emotional distress, and pain and suffering. By teaming with the finest physicians, engineers and other experts, I am able to maximize your recovery. Affordable lawyer prepared to help you The inability to work and accumulation of medical bills can add financial strain to the stress of injury. I will handle your personal injury claim on a contingency fee basis so you do not have to pay us to represent you until we recover compensation through a settlement or trial. Contact me today Consulting an attorney immediately following an injury is essential to the preservation of crucial evidence and witness testimony. In addition, California law places time limits on filing personal injury claims. To ensure timely investigation of your claim, I can schedule appointments on weekends or evenings and will make hospital and home visits. Call the Law Offices of Norman M. Finkelstein, APC at 619-232-1815 or contact me online to schedule your free consultation with a personal injury attorney who will treat your case with the compassion and attentiveness you deserve. Vallbona v. Springer 43 Cal.App. 4th 1525.